In the weeks since a judge found former St. Louis police officer Jason Stockley not guilty of first-degree murder in the death of Anthony Lamar Smith, protesters have taken to the streets nearly every night. While most of the people involved acted peacefully, in several incidents police have arrested demonstrators, and in some cases used tactics that are coming under scrutiny for their legality. As a result, the city of St. Louis and the St. Louis Metropolitan Police Department are the targets of several lawsuits. Smith, a 24-year-old black man, was shot and killed Stockley in 2011 after a chase. Stockley, who is white, was acquitted Sept. 15 by St. Louis Circuit Judge Timothy Wilson. Sept. 22 : Maleeha Ahmad and Alison Dreith, on behalf of themselves and a class of similarly situated individuals v. City of St. Louis. 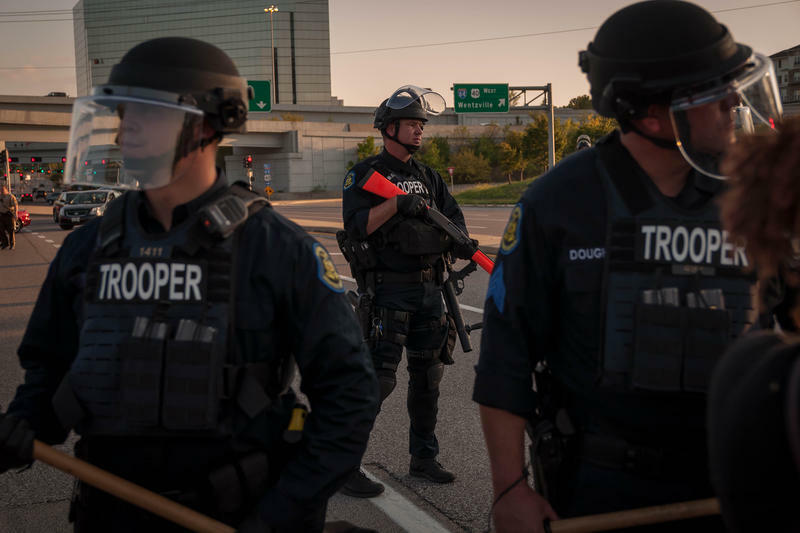 This federal civil rights lawsuit filed by the ACLU of Missouri accuses the St. Louis Metropolitan Police Department of violating protesters’ rights to free speech, due process, and the right to be free from unlawful arrests. The suit asks a judge to order the department to police the protests constitutionally. The lawsuit accuses the department of illegally detaining people by blocking them between police lines and then arresting them after a protest on Sept. 17. It also alleges that police indiscriminately used chemical agents like pepper spray on peaceful protesters. Alison Dreith and Maleeha Ahmad, the two plaintiffs, were unexpectedly hit with pepper spray while marching in downtown St. Louis on Sept. 15, the suit said. As part of this lawsuit, the ACLU filed a motion on Sept. 28 asking that the court order the police not to interfere with people who are recording activities and not to "abuse the ability" to declare that protesters are unlawfully assembled. The motion also asks the court to require officer to give adequate warning before spraying chemicals or making arrests. A second federal civil rights suit from the MacArthur Justice Center targets the city ordinances that allow police to arrest protesters, and how the police treat protesters once they are arrested. The lawsuit lays out several constitutional violations police are alleged to have committed when arresting protesters. For example, rather than citing and releasing protesters, police arrest them and require them to pay a bond, the lawsuit claims. That ignores Missouri policy of releasing someone on a promise they will show up, which is common for non-violent crimes when the person has ties to the community. The suit also contends the city won’t allow the court to drop cases if the evidence doesn’t support the charges. The city also is accused of trying to obtain guilty verdicts or pleas because it’s in the financial interest of the St. Louis municipal court. This lawsuit isn’t only based on arrests following the Stockley verdict. The plaintiff in the case, Nicholas Apperson, has been arrested many times over the past few years. Sept. 26, 2017: Drew E. Burbridge and Jennifer Burbridge v. City of St. Louis and John Doe #1, John Doe #2, John Doe #3 (in their individual official capacities). Drew and Jennifer Burbridge are married documentary filmmakers who were in St. Louis to film and observe the protests. The lawsuit claims police illegally detailed the couple, sprayed them with chemicals, physically assaulted them and then arrested them on false charges. The lawsuit includes three unnamed police officers, as well as the city of St. Louis and the police department as parties in the case. According to the lawsuit, both Drew and Jennifer Burbridge identified themselves as bystanders, but the police still detained them. The suit says two officers threw Drew Burbridge to the pavement and repeatedly kicked him, after his hands were restrained behind his back. It claims police detained both Drew and Jennifer Burbridge for 20 hours.